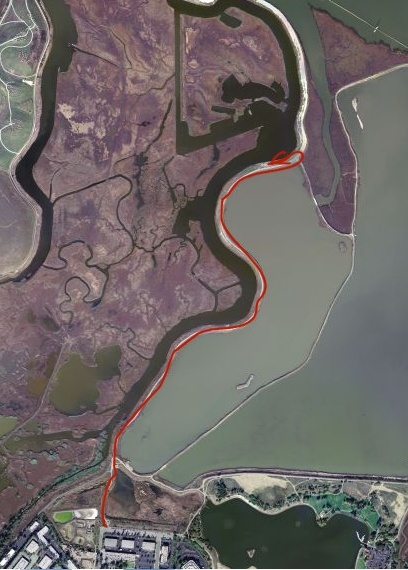 The "miracle quarter mile" located along Charleston Slough has white pelicans, hundreds of avocets, black nect stilts, turns, and many other birds. You get there by taking San Antino Road in Palo Alto east to Terminal road. Park there and take the foot path past the pumping station. If you want to make a shuttle walk out of it, park another car at Bixby Park otherwise turn around when you hit the "turning post" which is near a fenced off road that would take you off to the right jsut before the path takes a sharp turn to the left near the bay. If you want to just go a short distance that is OK as the highest concentration of birds is just past the pumping station building where there is a fork in the road. Go straight and not to the right.